A revised and updated recipe! In the 7 years since I originally posted this recipe, chicken karaage has gotten much better known in the western world. In the U.S. a lot of people now call it JFC, or Japanese Fried Chicken. I've tweaked the recipe a bit and cleared up the instructions, but fundamentally it's the same recipe I learned from my mom, decades ago. This is my absolute favorite way to make, and eat, fried chicken. Unlike other types of fried chicken, karaage never leaves me feeling greasy and slightly gross afterwards. Perhaps it's the ginger in the marinade, or the crispy-light surface, or the liberal squeeze of lemon added before eating. In any case, chicken araage is juicy and so crispy when hot, and still succulent when cold. It's great for bentos. My mom used to set aside a couple of pieces from dinner for my bento the next day all the time when I was growing up. The kara part of the word karaage refers to China, meaning that this method of preparing chicken was probably inspired by China. (The age means deep-fried.) In spite of its probable origins, I really haven't encountered a Chinese dish that is exactly like this, though there are many deep-fried chicken dishes in Chinese cuisine of course. The method of marinating meat in fresh ginger to get rid of any gaminess or so, which is quite disliked in both Japanese and Chinese cooking generally, is fundamentally Chinese I believe. This is a really simple recipe; just be careful of the oil and you'll be fine. You can make karaage with breast meat, but I think it's much better with the dark thigh meat. And, I know that skin-off is allegedly healthier, but it's so much crispier with the skin left on. Classic, crispy Japanese-style fried chicken. My Japanese mom's recipe, so guaranteed to be good. Cut up the chicken thighs into bite-sized pieces. You can take off the skin if you like, though it does make the chicken crispier. Peel and grate the piece of ginger. A microplane grater works great for this task. Put the chicken pieces in a bowl. Add the grated ginger, soy sauce and sake, and mix well. Let marinate for a minimum of 10 minutes. Around 30 minutes is ideal. If marinating for more than an hour (say, overnight), use 1 tablespoon soy sauce, then add the other 2 tablespoons just before you're ready to cook them; this prevents the salt in the soy sauce from drawing out too much moisture from the chicken. Heat the oil; if using a temperature-controlled fryer or a thermometer, aim for 180°C / 355°F. If not, a test with a single piece of chicken or a small piece of skin. Toss enough potato or cornstarch into the marinated chicken (drain off a bit of the marinade if it's too watery first) so that each piece is completely coated. Fry the chicken pieces a few at a time until a deep golden brown. Drain well - a wire rack is best for this, but paper towels work too. Serve with lemon wedges. Some people like to add a sprinkling of grated yuzu peel and/or sansho pepper. Potato starch, or katakuriko, is standard for karaage in Japan. It creates a wonderfully light, crispy, greaseless surface. It's not that easy to get a hold of in many places though (look in a Japanese grocery store), so __cornstarch__ (cornflour in the UK) is an acceptable substitute. Note that you can marinate this for as little as 10 minutes and it will taste really good. I prefer not to marinate it for more than 30 minutes, to let the flavor of the chicken shine through. If you cannot use sake, substitute one of the following (they are listed in order of preference): sherry, mirin, Chinese xiaoxing (shaoxing) wine (the label should say 紹興酒). If you can't use alcohol at all, add a pinch of sugar for the slight sweet flavor, and leave it at that. Vinegar is __not__ a good substitute for sake even if some websites and cookbooks say it is. Sake does not taste anything like vinegar. For an explanation of why sake and ginger are used in the marinade - besides for flavor - see this article. A thermometer is the most accurate tool for measuring temperatures of course, but here's a Japanese cooking trick for testing oil temperature that's surprisingly reliable. Just put in a pair of long cooking chopsticks (saibashi) vertically into the pan of oil, so the tips touch the bottom.The smaller and faster the bubbles rise out of the porous bamboo, the hotter the oil. For karaage the bubbles should be quite small and fast. You can buy saibashi at Japanese grocery stores as well as Chinese ones. Be sure to get bamboo ones, no plastic, or this trick won't work. I have a variation of this recipe, in which the chicken pieces are tossed in a tangy green onion-ginger sauce, in my Just Bento Cookbook. The tangy sauce makes the karaage really sing in a bento. This variation was recently adapted and featured as part of a Cook The Book week on Serious Eats. Submitted by maki on 2011-03-09 02:34. Maki -- that chicken looks absolutely delicious! I love all kinds of Asian (and Pan-Asian) food, but what could be better than deep fried anything (I sound like my mother here). There is a favourite dish I have from a Chinese Restaurant "Crispy Ginger Beef" that I am trying to develop a recipe for -- I wonder if this style of marinating and coating with cornstarch would work...? Any suggestions? Thanks Maki! I haven't had these since I was eating them from food stall to food stall, while doing the tourist-walking in KL, Malaysia. Hey Maki, This looks very similar to something we get at a local Japenese restaurant. They call it "Tatsuta-age" (maybe misspelled) -- possibly the same thing? I used eat Karaage or something similar; once a week, when it was a regular lunch special, at the Sakura Japanese Restaurant, located in the Food Court at the Moorestown (NJ) Mall and I would make a dipping sauce with light soy sauce, pickled ginger (Gari) and wasabi paste. It gave it a pleasant spicy flavor, to go with the crunch. Liz, yes I think tatsuta-age is basically the same as kara-age. In some recipes I have seen the use of mirin (fortified sweet sake) instead of sake. peanut oil is the best for frying in terms of taste. i usually mix corn flour and tapioca in 3:1 ratio to get a crispier mix. hi! i'm looking for a nankotsu no karaage special recipe. I ate them once but I couldn't tell what there was inside, I could only tell they weren't you average nankotsu no karaage. Is it possible that what there was inside was cheese... or garlic? Have you ever heard of any of those possibilities? 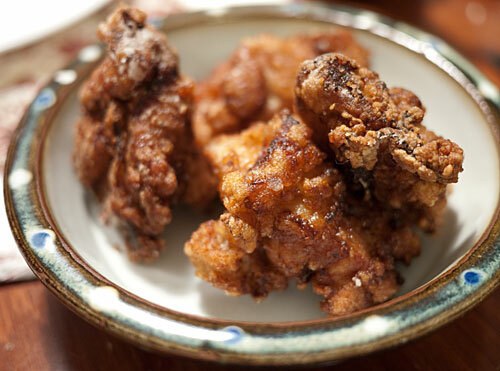 i'd also be greatful if you know of any good recipe for cooking nankotsu no karaage. how do i cut a duck (peking or chinese roasted) traditionally diagrams much appreciated. wow, this is the best recipie for karaage, i was always stuck between breast or thigh, but now i know to use thigh, and i was also confused between the flour mix, i used too mix cornstarch and plain flour together. thanks for clearing it all up~! I've been getting tons of recipies off your site, and they're all really good. I spent a year living in Japan when I was in High School, and it was a blast. Because I'm such a picky eater, my host mother(s) had a really difficult time thinking up things to cook me. But one thing was for sure, I really, really loved Karaage, so they used to say "when in doubt, make Karaage!" I've also used this recipie to prepare appetizer trays for parties I have at my place when my friends come over. Mmm, this sounds delicious! Is there a substitute you would recommend for the sake or the sherry? I don't do alcohol, even for cooking. Thanks! There really is no substitute for the alcohol here, since it serves a specific purpose - of getting rid of the gamy quality of the chicken. If you can't use alcohol, just leave it out. The Alcohol in the Sake does indeed help with the gameness of the chicken but it also adds flavour you could try substituting the Sake with Amasake (sweet sake) it has little if any alcohol content. Although it will give the Chicken a sweeter taste. Also if you are unable to find cornstarch. Substitute with Potato Starch (recommended) or last choice Wheat Starch. I actually brew my own Sake so i know whats in it. A lot of the commercially available Sake is not properly brewed and has Spirits added to the mixture. Properly fermented Sake with no added spirits has a much smoother and fruitier taste. Much nicer on the palate. I don't drink alchy either, but you should know that the "bad" parts of alcohol are burned away in cooking usually. It doesn't take much heat to kill the alcohol content, and in japanese cooking the alc serves a specific purpose (other than getting you tipsy) like in this case. I often use cooking sake or mirin in my japanese dishes for marinades. That's actually a bit of a myth; in most recipes containing alcohol, you don't actually get a significant amount cooking off. However, it doesn't mean the final product is going to have much alcohol content, because of the quantities -- here, you have two tablespoons of mirin (which contains between 1% and 14% ABV, depending on what sort you're using) and three of sake (usually around 15%), in a dish that gives four servings. Taken with the fact that only a little of the marinade ends up in the final dish, you end up with the equivalent of a small sip per serving. i made this today and i tell you, its delicious! i didn't have the sake so i used some plum wine (from the amish amana colonies) and it worked just fine. i love how the cornstarch makes such a nice light breading. this is definately going to be a regular dish in my household. I recently tasted karaage in a japanese restaurant in Paris, and fell in love with it ! Thanks for the recipe, I'll try to find boneless chicken thighs next week. just moved, kitchen was almost bare, had a couple thighs laying around, and this was perfectly easy, required little, and wonderful tasting! is there any substitute to sake/sherry for the recipe? Thank you so much for posting these directions! My boyfriend insisted on making me dinner yesterday and decided to make karaage--he used your recipe because it was the the most simple and straightforward ones he could find. I'm sure glad that he did! The result was delicious and crispy--even better than I remember it being in Japan. We served it with boiled cabage and chahan. I'd never had homemade karaage before so it was really a treat! I'll be sure to remember this recipe next time I make a bento! I've been at the market this morning and had the opportunity to buy some boneless chicken thigs (fairly cheap btw). I thought, why not, and ended up with my first worth-the-effort home-fried dish. Simple and delicious. ps: Thanks alot for maintaining this great site! I have tried several recipes from your sites (various furikakes, chicken tsukune, meat soboro) and this one is my favorite so far. We had a big batch last weekend and the leftovers barely survived (I used something like 7 thighs for 3 people). It was so good, I wanted to eat it for my next 10 meals. Thank you, Maki. This is incorrect...I'll try to address the karaage/tatsutaage difference soonish. This recipe brings back memories of when I was in Japan in 2006, stopping by the 7-11 every day on my way back home to get a few sticks of 100 yen karaage on sticks for the walk back to my apartment. Going to try this recipe soon. I used to live in California, and there was a place a few miles away that specialized in karaage. I never had to get the stove greasy or the house smokey because someone else made it for me for cheap. Now I'm in Europe (like you) and it's not that easy to get anything Japanese or even chicken thighs. They either have the skins removed or aren't available at all, so it involves a special trip and an order at the local butcher. But for this recipe, it's worth it. Thanks for sharing. I'm looking forward to giving it a try. Thanks for the recipe, I get this all the time from our local sushi cafe. Its so delicious and goes perfectly with some sushi or in a wrap with lots of cheese! We always get it with sweet soy sauce and japanese mayo. Perfect. This looks a lot like the salt-and-pepper popcorn chicken I used to get on the street in Taiwan, although that might be an adaptation of karaage than the Chinese dish from whence karaage came. Thank you for sharing an authentic recipe. That's how we made it fresh to order at a sushi bar in Hawaii. For ease of preparation we would add the marinade ingredients into a bottle, cap it and keep it out all day on the counter 'till an order came in. We'd give the bottle a quick shake; pour some over the chix pieces; toss with cornstarch, then without delay throw it into the fryer. The oil we used was previously used for tempura and prolly added a lil' flavor. I found it best eaten soon out of the fryer as the meat was most break-apart-tender and juicy. Thank you for posting this. This came out great: the chicken was very tender and it tasted so good! Next time I think I might try to adjust the taste by using a bit less ginger and perhaps add some sesame oil or something, but the recipe was excellent as is. Instead of corn starch can i use corn flour ? or tapioca flour ? Either should work fairly well, as well as regular white wheat flour, though the results may be more 'floury' than with cornstarch or potato starch. If you're in the UK, then what you call "cornflour" (fine, tasteless white powder) is in fact the same stuff as "cornstarch" in the US, or so I understand. Awesome kaarage chicken, first time making it & this recipe tasty and very easy....thank you! I wonder if I could use white cooking wine instead of sake for this recipe? Thank you. This is such an easy recipe and so delicious. I found this site a couple of years ago and now make this dish regularly. We used to buy the mix at the Japanese store. I usually have the ingredients on hand and it's so quick and easy to prepare. Best of all, my 8-year-old son likes it. Thanks for this site. I found it when you left a comment on a bento cookbook on Amazon. Congratulations on all your success with this website and your new book. Does anyone know if there's any way to substitute tofu pieces for the chicken in this recipe? I loved this when I made it - so much so that I want to make it for my vegetarian friend (which is kind of a contradiction, I know). I don't know anything about cooking with tofu, so I don't know if the sake would break it down or something odd like that. I also imagine it wouldn't have quite the same flavor, but would it taste happily like the marinade? Thanks for anyone who is able to help! There's also a tofu-edamame nugget/mini-burger recipe in my new bento cookbook, which has been excerpted over on Serious Eats. I'm also very curious now about tatsutaage, and while someone mentioned tuna above, I only see chicken versions when googling it. You thoroughly explain how to make the best dishes. I love chicken karaage. Potato starch is actually very easy to find in the US, if you know where to look and don't mind paying a bit extra. Bob's Red Mill- the company that does the organic, gluten-free, specialty flours, etc, has potato starch. Found it in that section of my supermarket. It's not always in the organic section, though. Sometimes Bob's Red Mill products will have it's own little section in very odd places, you just have to find it. I've seen it in the bread section and at my store it's near the baking section, at the end of the aisle. Given that it's a specialty company and NOT a storebrand or really mass-produced like cornstarch is here, it's a tiddly bit more expensive, but on the other hand, the package you get is 3x what you get in a box of cornstarch. Me too, I am a (new) food blogger from Switzerland (I read that you were wondering about where they are). I know it says "fried" on the name, but can I bake them instead? Baking them will not work at all. The surface will not turn crispy enough, and you'll wonder what all the fuss is about. This has to be fried. ginger and sake add great flavor to the chicken. It looks delicious! Man, if you ever have the opportunity to go to Sakashita in Gifu-ken (near Nakatsugawa and Magome), there's a little restaurant there called Senri that serves (I swear, and many others do too) the best karaage in Japan. Your recipe is my go to standard (and so much better than all that I've had in Canada since returning from Japan), but if you ever have the opportunity to get Senri's - seize that opportunity! This recipe reminds me of what's happening in Japan. Don't know how long until they can sit down and enjoy their speciality. I have used sushi many times, but never try this one. We don't have any Japanese shop around my area which is a shame. I tried this tonight and used potato powder. Is potato powder the same as potato starch? The lady at the Japanese grocery store told me it was the same. This turned out great so far with only about 30 mins of marinading. Want to try marinading it for long to see how it turns out. Thanks Makiko for this great recipe! This is a great recipe, good job. :D Thank you. About you book, I'm from Brazil and I'd like to have it. Is it possible or I just have to contact a company or something? Thanks. Just made this for dinner ... Sooo good!!! I didn't bother to cut it into small bite size pieces. I had Chicken Steak pieces, and I just used that. Came out yummilicious!! Is it possible to put the chicken pieces in a turbo broiler instead of deep frying them? I tried it a few years ago and it is usually the only way I like to cook chicken now-a-days. Great recipe! Thanks for the refresh. when you recommend dry sherry as a substitute for sake, do you specifically mean expensive Spanish sherry, or any dry cooking wine will do? I mean sherry, but it doesn't have to be expensive. Wine will give you a different flavor profile. Doesn't mean it will be bad but it will be different. I was looking for something other than plain old fried chicken and came across this blog. I am going to try this but was wondering if you could use wine instead of sake or dry sherry? Best recipe I've come across. Made them this afternoon. Was wondering, did you mean cooking sake or drinking sake in the recipe? Also, after I put the drained and marinated chicken into a clean bowl, I put in the potato starch, then proceeded to deep fry the pieces. There ended up being a lite white coating on some of the chicken. Did I put on too much potato starch? Thanks, Maki! Potato starch is often used in baking. It's gluten-free and is supposed to add lightness. Anyway, it's available on the King Arthur Flour website and I'm sure most baking goods sites, as well as some markets and shops that cater to bakers. I was wondering how well chicken karaage does when cold. I've been thinking about cooking some to try and also trying to cook some tamagoyaki and I was just wondering how it would work out if I decided to use them in bento. Exactly how much oil should be used? Visiting your website gives me ideas for bento making and how to prepare Japanese food. I am so grateful for these recipes. I am in the midst of training myself to prepare bento sets so that I can prepare them for my nieces and nephews year-end picnic with me. I was having a lot of problems making this recipe. I eventually got it right but I want to clear some stuff up for other people. The biggest challenge was getting that amazing crispy crust that we see in your pictures. I found no matter how many times I fried my seasoned/marinated chicken in potato or corn starch it never looked like that. My chicken had a barely crunchy, white sour tasting crust that was just horrible. Pretty lame, I must say. It come down to a very simple small step that is not mentioned. When you are done marinating your chicken, the next step is to put the potato/corn starch over it. Now this combination is very important and if it is not the right consistency it will turn out very badly. You must make sure that there is enough moisture in your marinated meat so when you combine it with the potato/corn starch that it looks like a sauce and not powdered. To rephrase, the corn/potato starch has to be wet and covering the meat with the consistency of a sauce not a powder. Thanks for the recipe! I hope this clears it up for those people like me! I can't believe it took me this long to make this - I've been meaning to for ages! Anyway, 11:30 tonight I finally decide to get to it (since I had extra chicken thighs leftover from dinner). Luckily I already knew about the mixing the starch and chicken thing because I saw a YouTube video about it some time ago (my thanks to Runny for that one! ), and it turned out beautifully. My husband loves it, which is good because I made it specifically for his lunch tomorrow. I think I might have a few pieces too! How do you fry it to golden color? I can't fry it to that color. My is white and crispy but very tasty. I made this for my mom,dad, and sister and they aid it was sooooo good! Thanks for the recipe, Maki. It came out fantastic, better than the japanese restaurants here in San Francisco. One question though. Here in SF I've had the karaage accompanied by a spicy aioli-style dipping sauce. I can't seem to find a recipe for this sauce or even a name for what it's called on the web. Do you have any ideas of what I'm referring to? Thanks again for the great recipes. I am guessing that it might be just Kewpie brand mayonnaise with some shichimi togarashi (seven-ingredient chili pepper powder) mixed into it. You can get both at Japanese grocery stores. Without tasting it of course I can't say for sure. It's not a standard sauce. A lot of people do like a bit of mayo to dip things in though. My stepfather loves to dip grilled and shredded dried squid in a mix of mayo and shichimi. Thanks for your interest, but I don't allow copying of my recipes or other content to other sites. Thanks for asking in advance. Thank you for posting this great recipe. I was in Tokyo and loved to eat kaarage many times. Now I am in India. Is there any alternative for Saake? Because saake is not available here. I made this tonight after reading this article over and over. I used to work in a Japanese restaurant and I loved the Japanese fried chicken there (especially with mayonaisu) and I was homesick for it... It tasted even better than the restaurant's! It took a while to gather the ingredients in my hometown, in fact I had to go to Mitsuwa up in Chicago to get the rest of what I needed for the entire meal I made. I didn't have sake but I used mirin instead and it was amazing... I got glowing reviews! The chicken was perfectly crispy on the outside and tender and juicy inside. I love it~! Thank you so much for posting so many delicious recipes! I may even invest in bento supplies the next time I'm in Chicago because I find all these foods irresistible. THis was the absolute best japenese chicken I've ever had. Even my kids liked it. This will be a regular at our house! For your delicious fried chicken recipe, thanx much! What a difference using katakuriko (instead of flour) makes - love the lighter taste. I was out of fresh ginger, though, and substituted a ginger spice blend (of finely chopped ginger) that I keep in the fridge. It seemed to work well enough, but will buy more ginger and prep JFC again real soon! Wow~ seems easy~ i love to try them out. but i 've got question. In my place, the soy sauce comes in sweetened and salt. so which soy sauce should i use for this recipe? I have no idea what sweetened soy sauce is. Use the salty kind. Made this for the first time today for my lunch/ husband's bento. Delicious! Definitely a recipe that's going into the rotation. Would it be possible to substitute sake with rice wine vinegar? Looks absolutely delicious by the way! Delicious! Just got done making it--and eating it--and it reminds me of the chicken I used to get in Japan. Thanks so much for posting this! ...so since I miss our abundance and variety of asian foods in Australia of I've made this several times: awesome. Thanks for posting it!! I just made this today, and followed your recipe exactly. It had a nice crunch, wasn't greasy like you would expect, and the chicken stayed juicy throughout (I used chicken breast). However, I think it was lacking a little something in the way flavor. Perhaps I am just too used to American fried chicken, which generally has more spices and probably too much salt. If I make it again I may add a bit of garlic powder, black pepper, and perhaps some paprika or chili powder. Anyhow, thanks for posting! The issue is probably the use of breast meat. This recipe is substantially better with dark meat. have very little time?try kikkoman brand kara`age seasoning.found it in the asian food section of HEB in south austin.the box suggested serving with ponzu(citrus or lime),but I prefer caravelle brand sweet chili sauce for dipping. O, these melted in my mouth. I had my The Guy mix up a batch of srirachanaise and they were heavenly. I found potato starch fairly cheap at my friendly local Latin American supermarket. Intercultural karaage! I have your bento book and I was going to make this for dinner tonight. I searched for this to find larger quantities. I am unsure how much oil to use and also I am wondering why your bento book says cornstarch (which I bought) and this recipe says potato starch first and cornstarch as an alternative. Should I go back to the store? Hi Carolyn, either cornstarch or potato starch are OK. I wrote this recipe many years ago originally, but in the book version I just said cornstarch since that is easier to get for most people in the US/Canada and Europe. As for the oil, you just need enough so that you can fry several pieces of chicken at a time. You may need to increase the amount of marinate proportionately to the amount of chicken you're using. I'm having a party on Friday and am going to be making about 7 little snack dishes, this being one of them. Way too ambitious - did not consider my time management before planning the menu, but this is one dish I just don't want to pass on. So, my question is; can I leave the chicken in the marinade for ~48 hours? Or will that be too long/weird? I'm hoping to start it tonight, then work on some others tomorrow, and bring it all together friday. Mom is Japanese & we grew up on karaage.Beats southern fried!